Also known as the Hoapili Trail, or the King's Trail, The King's Highway is an amazing path along Maui's southern coastline that treks across an out of this world terrain of jagged lava rock. The trail begins at the very end of Makena Road at La Perouse Bay and is roughly six miles in length. There are many historical sites of Hawaiian culture along the trail as well. Although somewhat difficult, walking along the King's Highway is one of the coolest things to do in Maui. Be sure to wear good shoes for this one! The Haleakala Ridge Trail features spectacular views in all directions as the path passes through volcanic cinders, brush and large forests of various trees including eucalyptus trees. Although not too difficult, the high altitude makes the hike a bit more difficult that it looks. The trail ultimately connects with other trails including the Redwood Trail in Polipoli Springs State Park. There is also a really neat cave that can be found off of a short spur off the main trail that some use as a trail shelter. If you want to see waterfalls while hiking on Maui, this is the trail for you. Located in Haleakala National Park, the Pipiwai Trail climbs through rainforest and bamboo jungle until you reach the prize of the amazing Waimoku Falls which are roughly 400 feet high. You'll also come across a really large banyan tree on this well-maintained four mile long trail. Wooden boardwalks have been constructed to make the trail much more manageable in certain spots. Once you get to the waterfall, please don't stand under it as getting hit with even a small rock coming down from that height could result in a you having a bad day or worse. The trail is also near the famous Seven Pools swimming area which is a perfect spot to cool off after your hike. One of the most popular trails in the Haleakala National Park, the Sliding Sands Trail is one of those special things to do in Maui. Despite the name, the trail is not sandy, but rather is a moderately compact trail of cinders which is easy to walk upon. That said, the hike isn't exactly easy as there is a very large change in elevation and the air is quite thin given the altitude. This amazing trail passes through the floor of the Haleakala Crater and has views that are truly out of this world. You can even see the big island of Hawaii on a clear day. Keep your eye out for the silversword plant which is unique to Hawaii and found nowhere else on Earth. The full length of the trail is over ten miles in length so many hikers bring their tents to make this a multi-day trip. Alternatively, many will hike the first section of the trail to the cinder cone and turn back for a good half-day hike. Whether you are hiking in Maui on your own, with a friend, or hiking in Maui with kids, the Iao Valley Trail which runs through the Iao Valley State Park is an excellent choice. The trail is a family friendly path of low difficulty that runs through one of the wettest locations on the Earth and you will see some of the most amazing plant life imaginable. You will also earn a spectacular view of the Iao Needle, a natural rock pinnacle rising over 2,000 feet above the floor of the ancient volcanic crater. Iao Valley is the perfect choice for one of those hot days on Maui as much of the Park and trail are protected in the cool shade. A breathtaking view of Central Maui can been seen from this trail which ends at the top of Lanilili Mountain. 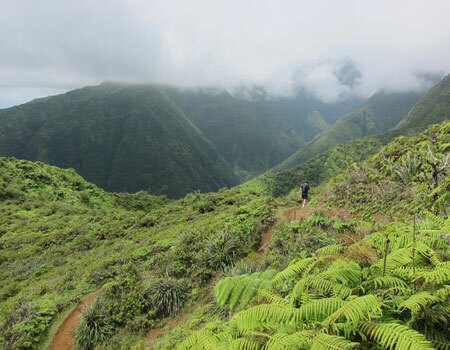 The Waihee Valley Ridge Trail is roughly three miles long and is moderate difficulty as there is a change in elevation of approximately 1,500 feet. Be sure to bring your camera to capture those amazing panoramic views of Maui. There are quite a few waterfalls visible from the trail as well. This area is often wet so be prepared for a muddy trail. There is also a perfectly placed picnic table at the summit of the mountain which is the perfect spot to rest or to have a lunch with unbeatable views. Please note also that hunters occasionally frequent the Waihee Ridge Trail so wear bright clothing to be safe. The Redwood Trail is a really neat 2 mile hike located in Polipoli Springs State Park. A great variety of trees can be seen along the trail including the majestic redwoods. The hike is of moderate difficulty with an elevation gain of approximately 1,000 feet. The altitude is over a mile high as well which adds to the difficulty. That said, Polipoli Springs State Park is one of those places on Maui that you should see and this hike is an excellent excuse to make the trip. Seeing a redwood forest while on Maui almost can't be beat! The Hana-Waianapanapa Coastal Trail follows the rugged coastline near Hana Bay. The coast here is littered with massive jagged black lava rock meeting the deep blue ocean making for a great view while hiking the trail. The trail runs a couple of miles to Waianapanapa State Park where they have plenty of picnic tables and even a few cabins that you can rent. The trail then continues along the coast to the Hana Airport. In addition to the amazing views, you will also likely see many local fisherman fishing along this coastal trail. The Kaupo Gap Trail is one of the most difficult hikes in this guide and is considered an extreme hike by many, especially if you hike starting at the coast. This trail goes from the very summit of Haleakala and goes all the way down to the coast near Kaupo. In all, the trail is approximately 20 miles long through the Haleakala National Park with an elevation change of around 10,000 feet and there are several cabins along the way. Experts only! A short hike off of the Hana Highway (Route 360) near mile marker 2 leads to a couple of impressive waterfalls and the first really good waterfalls that are accessible along the Road to Hana. Depending on how much rainfall has come down in the area recently, you are likely to see more than two waterfalls along this trail. The first waterfall used to have a rope swing into the pool which some more adventurous types would take advantage of, but rumor has it that the swing has been removed. A great choice if you are hiking in Maui with kids. 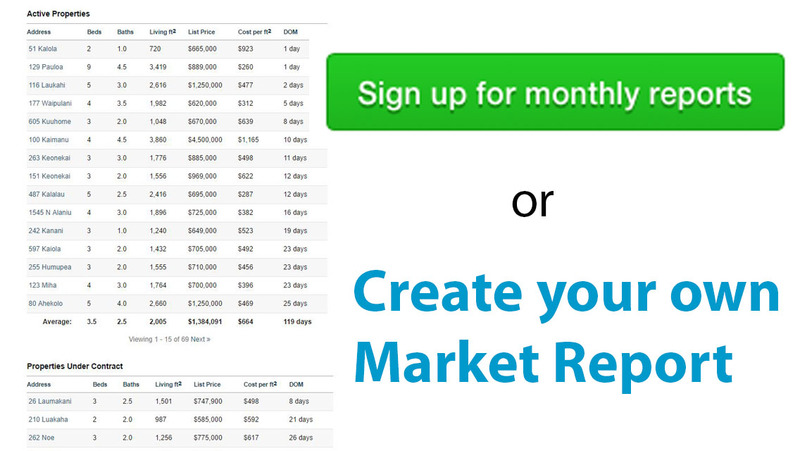 "Roger is an outstanding real-estate agent in many point. 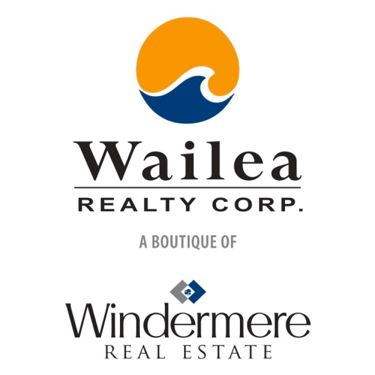 His knowledge in Kihei, Wailea region is impressive! 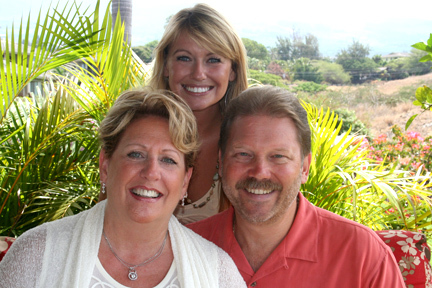 He knows the complexes by heart in many ... more "
"Roger's in-depth knowledge of and experience in the South Maui market was a real plus to me, a first-time condo seller. He patiently answered all of ... more "
"I know of no one what who offers the complete service before, during and after the transaction, buy or sell. He gives you his "full attention" any ... more "